Connect the dots across space and time to create vivid original images and designs straight from the world of Doctor Who! 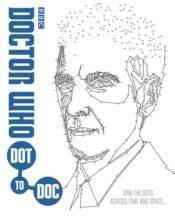 Join a galaxy of dots to draw the Doctor with this incredible connect-the-dots book! With 45 intricate portraits to complete and over 500 dots in every drawing, Dot-to-Doc contains hours of creative and timey-wimey fun. Inside you'll find every incarnation of the Doctor, plus favorite friends and foes - Rose, Donna, Captain Jack, Clara, the Ponds, a Dalek, a Cyberman, a Weeping Angel and many more!